This past week has taken me on another trail, lots of trail. 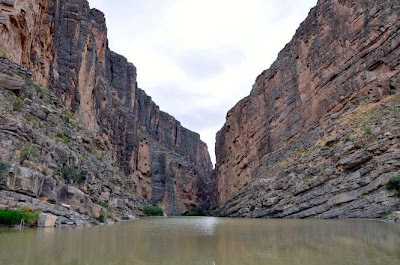 For a week we have been out in West Texas to do some hiking in the Big Bend National Park and surrounding areas. 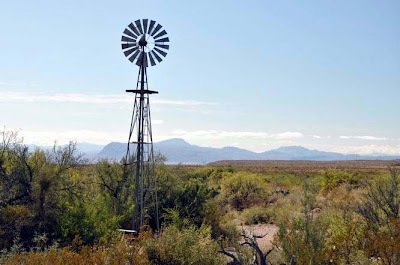 This is Texas as the Italians love to romanticize Texas and The West, with huge vistas, wide rivers, lots of wild animals and plenty of big blue sky during the day and starry, starry skies at night. It was also very therapeutic this week, because out there the cell phones do not work. So lots of rest and respite from the civilized world. During the last five or so years September has taken me to the wine trail in France, Portugal, Sicily, and Italy. But for some reason this year, I needed a break from Italy and wine. For one glorious week I didn’t think about whether a wine was natural enough or not (btw, the more natural the wine is the happier my headache prone skull is). I didn’t drive very much and when I did it was never over 45 mph and usually to a placer to hike for the day. I got sunburned and star burned even more, because out in the Big Bend the sky viewing is amazing. Oops, looks like I am full speed ahead into a mommy blog post. E' la nave va.
Dallas to Midland is a short one hour flight. 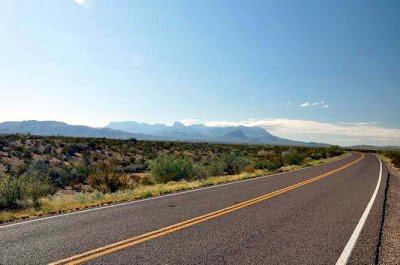 In a car the drive to Big Bend is a lot like flying to Europe. Long. So the program was Midland via SW Air and then a rental car for the 3 hour trip to our first destination-Marfa. Marfa is that little town in West Texas where a person like me can feel like this was a town made for people like me. Good food and wine abounds, interesting and friendly people, lots of art and the wide open sky of the romantic Texas Italians love to fantasize about. In a little café in Marfa, Maiya’s we set about our first night to nosh. Maiya’s is Italian-centric so there are some nice food and wines to choose from. We settled on a Pio Cesare Gavi, a 2004, that was nutty and in perfect ready-to-drink shape. I did say 2004; there must be something about the dry West Texas conditions that keep a 5 year old Italian white in shape. But anyone who has ever had an older Gavi knows that a good one can take some age. 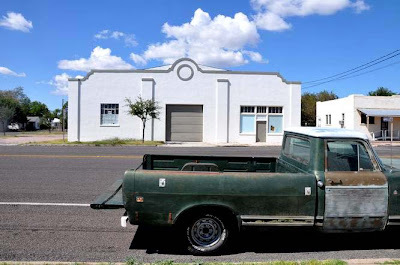 Marfa is an artistic community centered around, but not exclusive to, the efforts of Donald Judd and his Chinati Foundation. I will be heading back to Marfa soon to do a series of wine and food dinners, hopefully with some artistic element added to it. My university background was in art and architecture with photography, film and cultural forms studies making up the curricula that I focused on. Marfa is really a place out of my American West soul. 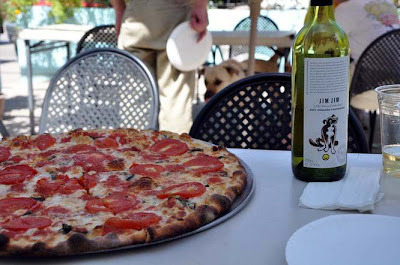 And you can find a pretty good pizza there too, in this dog loving town. 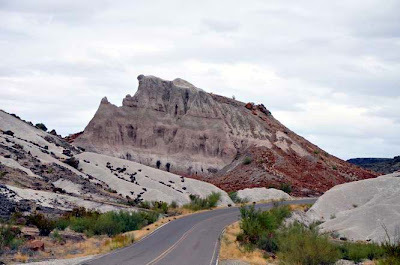 I grew up in California in the western part of the Sonora Desert (sometimes called the "Colorado Desert"). 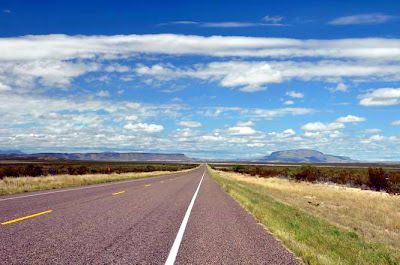 Marfa and Big Bend are part of the Chihuahua desert. So not exactly the same, but enough similarities for me to be very happy. On long walks in the Chihuahua desert this past week, I could have sworn some of the trees were brujos and of course I thought I could smell the snakes (another post, but yes, snakes do emit a unique odor). At night looking out the window I felt the pull of the billions of the galaxies and stars. One night I even think there were things other than stars that were reaching out to me. Yeah, yeah, I know, active imagination. 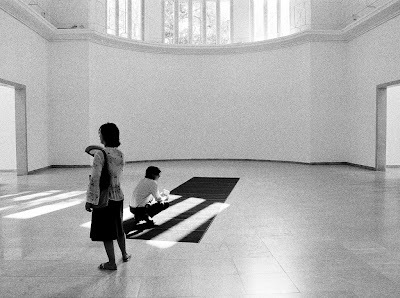 But the world we think we see isn’t “all there is”. 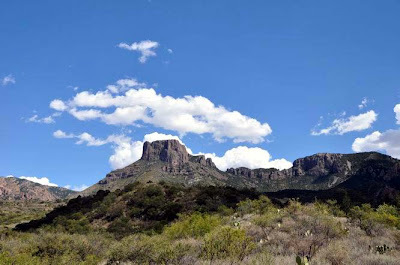 What something like Big Bend and other National Parks can do for the common man like myself is to find me a place and a time where I can go to restore my equilibrium from the pressures of civilization. It’s in the wilderness that I can find my lost self. Monday morning I head back to work, but not before having had a glorious week like I haven’t had for years. I think it was probably back in 2005 in Portugal where I was able to re-up my energy. 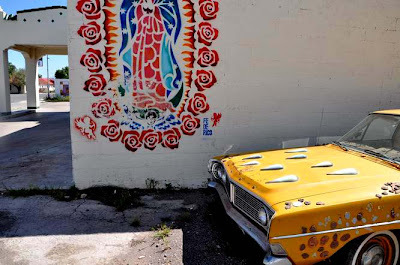 Not saying that the work or even the urban scene of Texas is all that stressful. It isn’t like living in NY or even LA. Because Texas, for me as well, is a romantic notion or freedom and unlimited horizons, as much as it might be for the Italians I often come into contact with in the wine biz. These next few weeks Ken Burns is screening his National Park opus on PBS. Thankfully, I have had a week to immerse into one of my favorite National Parks in America. And while it might not be as obviously beautiful as my California love, Yosemite, Big Bend is a wonderful, peaceful, dangerous, beautiful, mystical place that for a desert dweller I have managed to save a large part of my heart for. 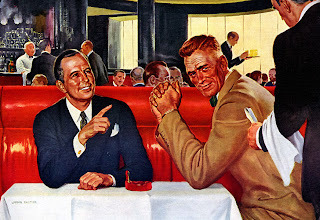 There they were, waiting for me as I landed in Dallas from La Guardia, the good ‘ol boys. I had just come back on a flight with a guy from Midland, born and raised in the dusty desolate town that's had its share of desperados. This ‘ol boy, he luuuvvved Midland. But his lady friend lived in New York. So he had to haul his tail up there to get whatever he thought he needed from his gal in Gotham. One thing he said, and he said a lot of things, ‘cause he was about two days too many away from Texas, he said, “There’s too much concrete and not enough sunsets.” I couldn’t disagree. Something about living in the West that just gets under your skin. To make matters worse, he pulled out the latest copy of Texas Farm and Ranch magazine, and he asked me if I wanted a look-see. Damn him. They got me with that little Hill Country spread in Bandera County. Real nice. Meanwhile, giant mosquitoes are attacking me in my bed and it's just March. I’ll never get out of here. 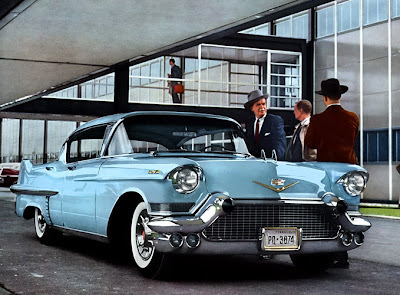 Cadillac fever’ll get me. At the Dallas airport, the old man was waiting by the car, lighting up another cigarette. He looked like he just came from a funeral. It was 12:30, time for a late lunch. All that NY pizza and vegetarian food ‘like to mess up my regimen of steak and ribs. That was about to get rectified. At the chop house, the usual table was waiting. Liquor was ordered, not wine. Time was slowing down, and something was about to fall from the sky, I felt an impending message coming on. Nowhere to run, nowhere to hide. Better just 'buck up and face it, sooner than later. Yes sir, don’t want the lights to go all blooey on us. And with that, juicy steaks arrived with baked potatoes and lots of farm fresh butter and chives and sour cream and fresh pepper. It wasn’t cold outside, and the landscape wasn’t littered with dirty grey-black snow. It was 68°F, and bright and clear. Afterwards I set out to find Beatrice Russo. It seems some of my old wines had been depleted. I noticed a bottle of some ancient Barolo in the trash bin, along with a Champagne bottle or two, a Roederer and a Pol Roger. And a bottle of La Chapelle Hermitage 1985. Oh yeah, and my bottle of Gran Gala that I had sitting there to take to the newspaper, so they could photograph it for an article; it was 2/3rds empty. I better go find that young lady. The picture above is a favorite of mine. It hangs in my bedroom. 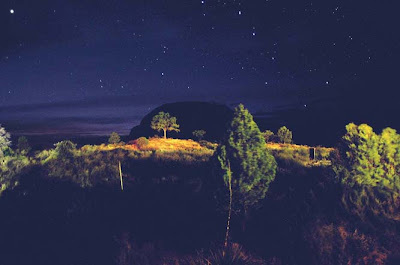 Shot by James Evans, who lives out west in the Big Bend area of Texas. 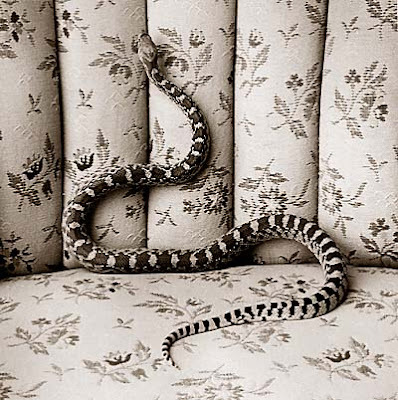 It is of a bull snake on a couch. I love it for the texture and the movement and the hint of danger. But the bull snake isn’t lethal. It just looks that way. Things are all mixed up these days. 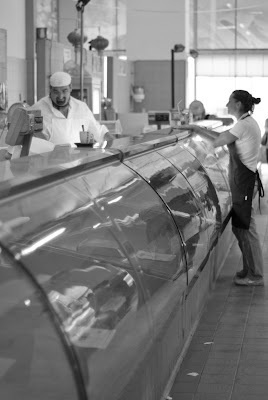 We seek local and pummel the word sustainable about, like a swordfish being cut up for the seafood counter. But what are we really looking for? Are we looking for the truth? Do we want to fear something that really isn’t worthy of such trepidation? How does that relate to this Italian wine thing? Let’s look at these words: local, unique, safe, affordable. Local- Unless you are in Italy, Italian wines aren’t going to be considered local. So one must consider the trade off. You can get a local wine in most places, and it should be good enough for your needs. You could also drive a car (If you are in the US, a Chevy, for instance) and it will get you where you want to go. One doesn’t need a Maserati anymore than one needs a Brunello. 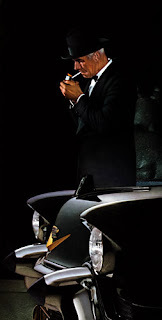 Oh, but, you say, you like the Maserati and the Brunello? Because it is unique. OK. Unique – Just like Bar-B-Q is unique in Texas, or Ruby Red grapefruits from the Big Valley down there, things unique have a way of endearing themselves to folks. They are dear and often precious. 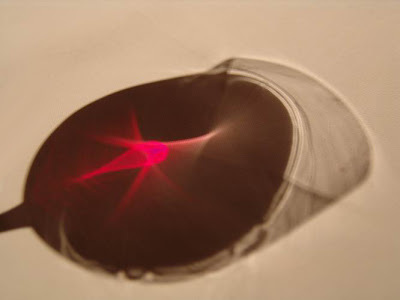 Taste, texture, feeling, scent, many facets of the jewel that one is attracted to. 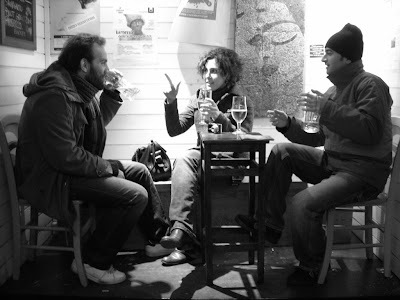 Italian wines are unique and so because of that people are drawn to them for pleasure and enjoyment, stimulation, physical as well as intellectual. And because of this we can be reasonably assured that the product is good for us. It is safe. Safe- very much buzzing about this lately. People are inventorying their possessions and jettisoning things made in China. Clothing made in Bangladesh or Costa Rica, are the conditions for the workers safe? Or would their lives be worse off if they didn’t have that job? Meat packers in the US, in the early 1900’s, children in factories in the late 1800’s, scenarios that played out for cheap goods but at the expense of the health and welfare of the humans, or other living creatures, involved in the production of these materials. Today not many of us make our own clothes, and fewer and fewer are making their own meals. 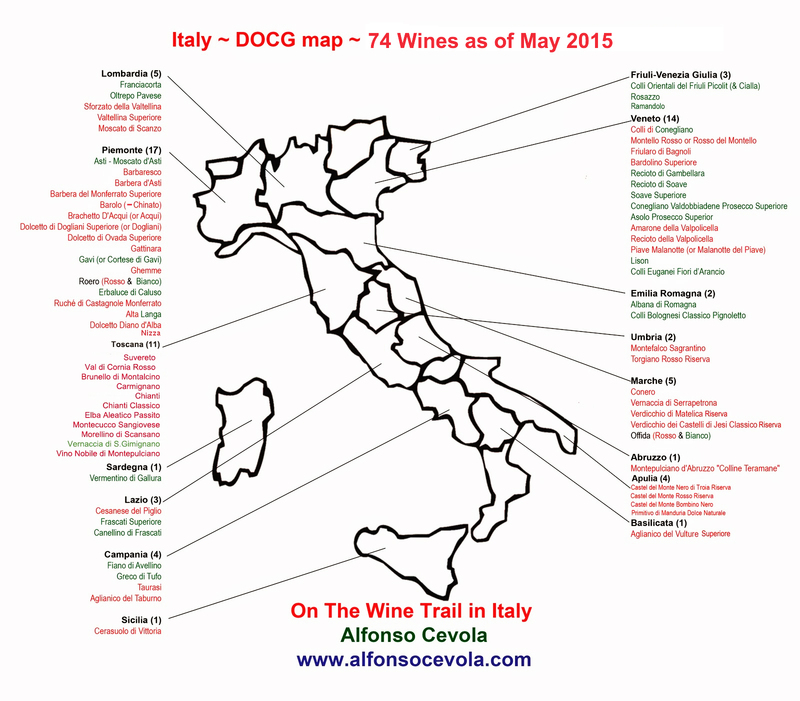 Italian wines, while not all have been always safe, have a record as good or better than much of the world wine producing areas. And often affordable. Affordable – Up until recently Italian (and European) wines and other goods have been a good deal for those using the US dollar. There is a pause, at this moment, because, we are seeing the erosion of the US currency. The Canadian dollar is climbing over it, the Euro has left it behind, the Yuan is a rising red sun. An Italian Chianti now sells for about US$12.00, on average. Yellow Tail Shiraz sells for US$8.00. Now there is a difference; the region, the grape, the experience. But the challenge in 2008 and 2009 will be large, and marketers and wine lovers will be challenged to make sure they don’t sacrifice unique and safe over affordable. The snake is in the living room, settled and comfortable on the couch. It will take plenty of effort and courage to look it straight in the eyes and determine if it is dangerous or not. 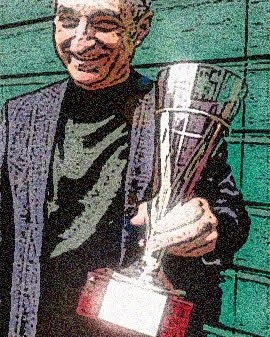 The challenge, of our perceived view of things, will be to generate a reality that will still honor the local producers (even if they are thousands of miles away) and encourage them to retain their unique qualities along with continuing to make them safe and wholesome and if possible, within our means. 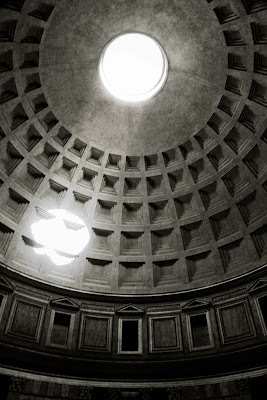 Photographs: Top one by James Evans; all the rest from the Flickr Italy in Black & White photo group. All week the wine has been dogging me. There it is, like the omnipresent character in a Twilight Zone episode. Every corner you turn, he is waiting with that silly little smirk on his face. Taunting, laughing, obstructing. I took a look at the Brunellos we have in the market. In one store yesterday they had on the shelf 1999, 2000 and 2001. All considered good to great vintages. Sitting on the shelves from $50-75. Good producers, no flies. Not like some end of the world rations that sat in the bomb shelters waiting for someone to climb on down and wait it out, while the rest of humanity sweated it out on the beach. What to do? I need an idea that works. I really need to come up with something, pull something out of my repertoire. Show the rookies this is just a cycle. Make it to the 26th mile. Again. This is a singular moment for me. In thirty plus years I cannot remember this pattern happening quite like this. Down economy, trying to recover. Wine, tainted by a hot vintage and a scandal. Lousy exchange rate caused by a government trying to discourage foreign trade by weakening the dollar. And a stellar vintage, waiting in the wings for a window of opportunity that isn’t quite now. The 2004 Brunello is Cinderella. But while the planets move backwards what can one person do? This is like having to eat tainted meat while the perfect pie is cooling on the window sill. This is torture. Not like Abu or Gitmo, but for slaves to the wine god, this is a perfect storm debacle for the ’04 Brunello. More like Mars in retrograde than Mercury. Two visitors, like passing planets across the skies, light up the screen with their brief candles. Let’s hear what they have to say about the bright light in the Montalcino skies, the 2004 vintage. Tonight I heard the owl. He was back in the neighborhood for a visit? His home has been long taken over by the Italians, the sweet and gentle bees that have outgrown the owl house my son put up in the tree in our front yard. But the bees do so much good for this little island of nature, my yard, or rather, the yard that I have been entrusted with to care take it and offer nature a respite from the willy-nillyness of a world that is barreling down the crazy highway at the speed of sound. All weekend it has rained welcome rain. 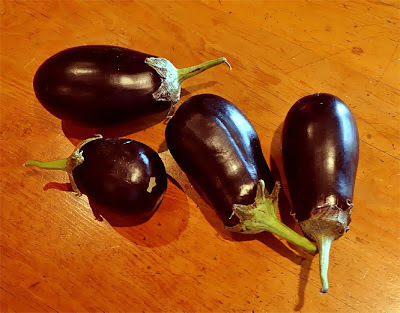 The summer harvests of eggplant and cucuzza squash piled up on the kitchen counters, along with tomatoes and farm eggs and chickens that lived their life on the ground in the open air. This weekend we would feast from the harvest. My little island, l'isola da Cevola, is my retreat back to a piece of nature where there is no poison. The local government, spraying this week for West Nile virus, worried me. My Hoja Santa crop is ready to harvest a load this week. But the trucks spraying God knows what concerned me. Three days of rain have lessened my apprehension. This has been a fine summer for my little enclave of nature, this isola with a little lago and all the bees and frogs and owls and sparrow hawks convene over and in this welcome spot of peace and simplicity. Even the lost parrots, who go quite insane in the winter when the climate dips below their threshold of acceptability, right now are flying overhead with none of the worries of the below zero weather some day to come. The rosemary, when it was planted in the ground, did nothing. Too wet. So I put it in a planter and it turned into a tree. It has branched out into the swan planter, someday to be moved and improved to the other side of the garden. The figs, long gone, as are the mockingbirds that feasted for weeks, will soon lose its leaves. My Sardinian fig tree. This has not been a great year for jalapeno peppers in the garden. A small handful of them came this year. Maybe they missed not having the pequins as next door neighbors. As usual, the basilico thrived, and often we took tender leaves for the dinner table. Last night we had the cucuzza with the chicken and some tomatoes, pasta and basilico in a dish that was unbelievably delicious. The winter garden is transitioning from fennel and the bitter lettuce to arugula. In October, I will add more winter lettuce and radicchio to the plot. The garlic this year was tiny but potent. It had a flavor that I have never had from any garlic. The terroir of l’isola da Cevola. Who knows? Maybe it was the full moon at midnight harvesting. The compost bin is full, and after the last of the Hoja Santa is harvested for Paula and Mitchell at the Mozzarella Company, we will start preparing that part of the garden with more organic compost. Two days of living in my little world of nature does wonders for me. With the world raging toward incivility outside of this little enclave, it is a spot of heaven that renews my will to go out into the world and wage my daily battles. 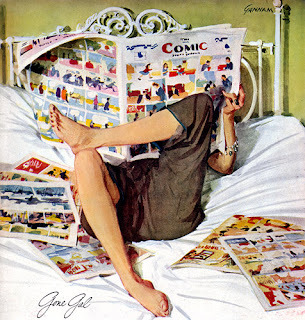 And how about you, dear reader? How do you connect to the natural world all around you? Are you in the country? A big city? On an island? In Italy? Or India? What in your world is going on right now? Lately at wine dinners and talks, people ask me how I got into the wine business. I tell them it was an accident, and a damn lucky one at that. Often we talk over certain wines, maybe they were epiphanies, maybe they were special wines along the trail of a lifetime. I am a label saver. These are the stories about twelve of the unforgettable ones. 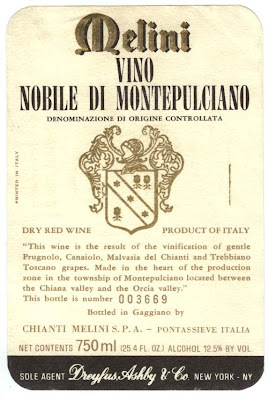 I was working in an Italian restaurant and we must have had ten cases of this wine, the 1970 Vino Nobile di Montepulciano from Melini. It was a good wine, a good year and the stars aligned around this wine. I think the wholesaler was selling it at the time for $5 a bottle. I bought a case for my house. This was the wine that made me fall, in a big way, for Vino Nobile. 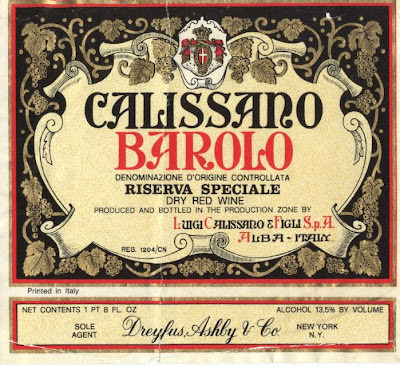 The same wholesaler also had a bunch of Calissano 1969 Barolo and Barbaresco Riserva Speciale. They were asking about $10 a bottle then, around 1980. I had a little wine bar that I was running at the time, and we had it on the list for about $20. I still have a bottle of the Barbaresco in the wine closet. This was my entry into the wines of the Langa, one that endures for going on 30 years now. When I started working in wholesale, the company I worked for had some eclectic wines. One of them was the Scanavino Barolo, also a Riserva Speciale 1969. We sold the wine for about $8 and often discounted it lower to move multiple cases. 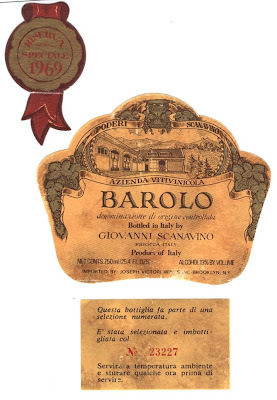 It was a “value” wine, meaning that it filled a category on a wine list or in a wine shop for a Barolo that folks wouldn’t get scared off by the price. I liked the wine enough, much better than the cheaper Orsolani wines that were really rock-bottom priced. At least Scanavino looked official with the label and the bottle (what we did in those days to interest people in Italian wine). It was far from making the world safe for (or from) Italian wine. The company also dealt directly with Angelo Gaja. We had a bunch of his 1976 Barbaresco and 1978 Barbera. The 76 Barbaresco was a funny wine. Hot year, the fruit was fleeting and the acids were searing. But the juiciness of the Nebbiolo grape, especially from the kinder and gentler Barbaresco appellation, made a wine of interest. It was expensive, selling for over $20 wholesale. 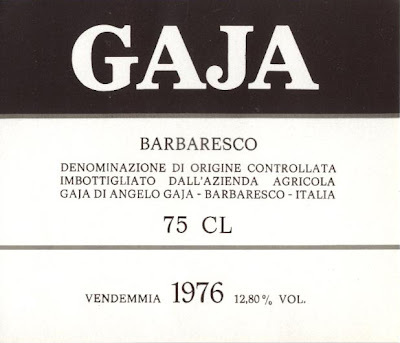 Somewhere I have a file with Telex communications I had with Gaja about ordering the wines. I will dig it out and blog about it sometime. When I moved on to another company I came into contact with Armando de Rham and his company in Florence. Armando had an office in the Piazza Annunciata, where I once stayed for a month in a hostel run by nuns. 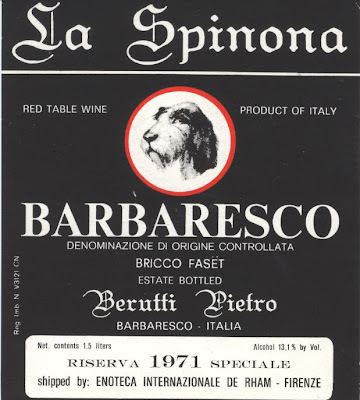 One of his wines was this 1971 Barbaresco from La Spinona. I still see Pietro Berutti at Vinitaly. He is very old now and bent over. Sometimes I walk by his booth and he is napping. Like his little dog on the label, he has earned his rest. I loved this wine and the people who made it and we made a lot, a lot, of friends with this wine. We sold it for about $11-12. The wines of the Maremma, in 1982, were unknown to America. But the Le Pupille 1978 was a groundbreaking wine. Tachis oversaw winemaking there and the 1978 vintage, another year of 13 moons (like 2009) produced a rich, fruity, grainy, delicious wine. We sold it for $5, and it was an uphill struggle with the Italian restaurateurs. 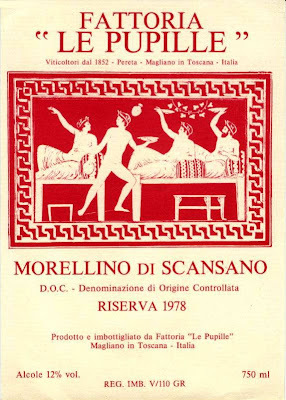 Now Morellino is more fashionable, but I am not sure I have ever had one as good as the way I remember that 1978. 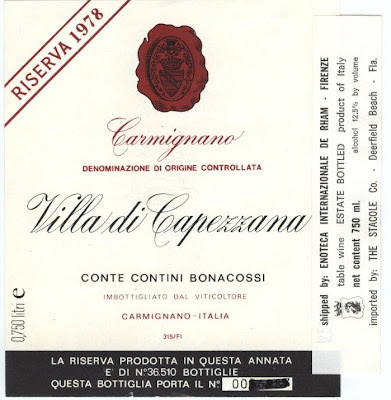 Villa di Capezzana is an old favorite of mine. This week, the grandson of Count Ugo Bonacossi, Leone, was in town and we worked the market for a day together. Leone is half Tuscan and half Sicilian and he is an old soul. His first love is art, but the winery and family called. And so Leone is in America for six weeks. The 1978 Carmignano was a revelation, as was the 1975 we also offered. 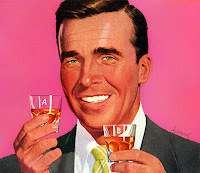 My colleague, Guy Stout, fell in love over a bottle of Carmignano. His first two sons are here, partially thanks to the Villa di Capezzana. The current wine, the 2004, is as good as the 1978 was. I remember the 1937, when Armando got us a couple of cases and I sold them to an Italian restaurateur in Fort Worth, Texas. Unfortunately his wife and he went through a messy divorce and I fear some of the wine went missing. Or so the story goes. 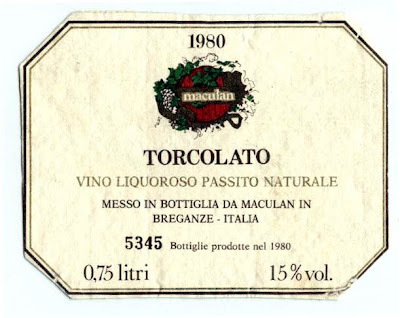 When I went to visit Lou Iacucci in Queens in 1983, he turned me on to Maculan and Torcolato. I remember what passion Lou had about this wine and wine in general. But thanks to Lou I became infused with a love for the tropical dessert wines from the Veneto. Ciao, Capo. 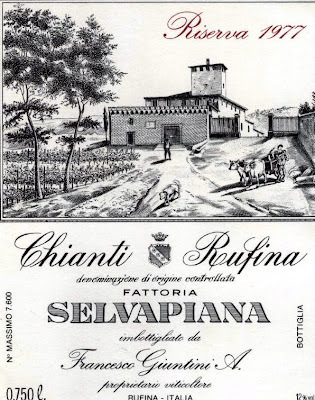 The Selvapiana 1977 Chianti Rufina Riserva was a wine l loved to sell and to drink. We sold it for $7, a steal. And the wine aged very well. I drank my last bottle of 1977 in 1997 and it was velvet. Francesco Giuntini, a relation to the Antinori family, looked after this property. They made a wonderful olive oil which we had many cases of and by which I learned to love Tuscan olive oil, made all the more dear from the deep freezes in the 1980’s that decimated the olive trees in Tuscany. 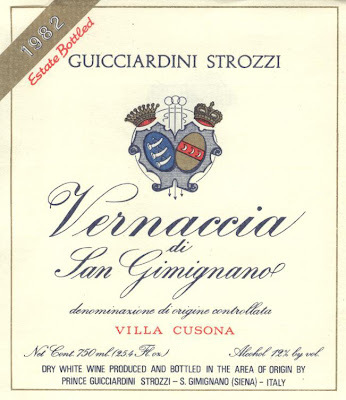 I have had a love affair with Vernaccia. On again, off again, that kind of affair. But when it was good it was really good. The Strozzi 1982 was a spot on specimen and it brought a lot of pleasure to the people whose hands (and mouths) I put it into. Remember, this was in a time when Italian white wines, as a rule, were pretty dismal, oxidized, yellow to brown wines that barely made the ocean voyage. 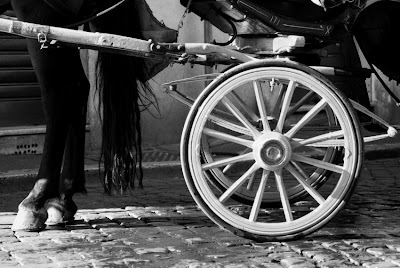 The Vernaccia was a tough old bird and loved to travel. I have fond memories of the happiness this wine gave to many scores of people. 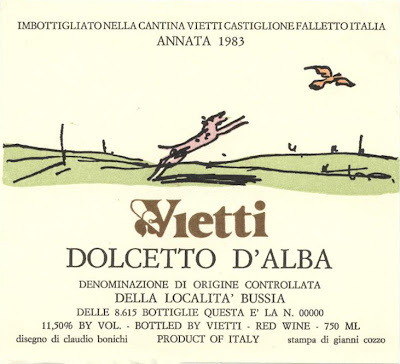 Vietti was a winery that set Piedmont on its side. The proto-critter labels, the modern winemaking approach, these were difficult wines to sell in 1984. But the Dolcetto was one of my faves and I loved to put this in the hands of willing Italian restaurant owners. My restaurateur friend Alessio was one who understood my passion and supported it with his loyalty. The wealthy and influential, the cream of Dallas society, drank these wines at his little restaurant, and they loved the experience. Those days have changed, but the memories stoke the fire of my passion today. 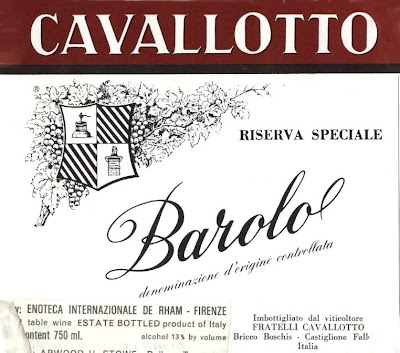 Finally, the 1975 Cavallotto Barolo. Another Riserva Speciale, from Castiglione Falletto. 1975 wasn’t a vintage that many people knew too much about, but the wine had great fruit and balance. It was a big wine that was a gateway for folks sticking their toes into the greater Italian wine pond. I have great fondness for this wine and for all of these wines, as they were some of the wines that have defined my life in wine. And when people ask how I got into this wine business I have wines like these to offer up as evidence of the miraculous little accident that is my life, here on the wine trail in Italy.